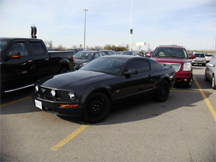 A Mustang GT illegally occupying two parking spaces at Vaughan Mills Mall, Ontario. This parking technique, which is not uncommon, is designed to prevent other drivers from parking beside the offender's vehicle. In close quarters, some drivers or passengers accidentally dent the vehicles parked beside theirs when they open their doors widely enough. The Mustang driver is trying to prevent these incidents by parking in a manner that makes such close-quarter incidents unlikely. This behavior can be interpreted as a narcissistic breaking of the rules about parking within the lines of each space. Of course, other drivers, angered by the Mustang driver's narcissistic behavior, might then intentionally and anonymously damage the Mustang in a variety of ways, including tire slashing, egging, "keying," and other forms of vandalism. Someone who typically exhibits narcissistic behavior doesn't do so by accident. Because behaviors we regard as narcissistic are generally offensive or hurtful to others, behaving narcissistically requires violating social norms that most of us recognize as necessary for social peace. To systematically choose these behaviors, one must believe that one is special, and that the social norms apply only to others. The third item is the belief that one is special. It's fundamental in the sense that it's the basis for granting oneself permission to exhibit the other behaviors and attitudes. Without a belief in one's specialness, the sense of shame and guilt about violating common social norms could be overwhelming. For convenience, in this series, I've been referring to the person exhibiting these behaviors and attitudes as either Nick or Nora. This time it's Nora. Let's now have a closer look at specialness. Nora breaks rules of all kinds, because rules are for everyone else. Indeed, complying with the rules puts her at risk of losing her claim to specialness. Nora therefore feels compelled to break rules and violate norms. In meetings, she believes that she has the right to interrupt whoever is speaking to say whatever is on her mind, whether or not it's on topic. She doesn't wait to be called on to speak. Her status reports are late and nearly content-free. Her expense reports are bloated with receipts that she picks up in airports and cafes, and which other customers had discarded. She flies business class instead of the company-mandated coach class whenever she can find a flight that's fully booked in coach. In violation of laws and corporate policy, she asks her subordinates which political parties they support, and "strongly encourages" them to contribute to political causes she favors. Narcissistic specialness differs from the "everyday" specialness that's associated with the uniqueness of our roles or our talents. For example, in meetings, the Designated Digression Detector is empowered by everyday specialness to interrupt at any time, even though others are not. The group or the situation confers everyday specialness — not the individual. By contrast, Narcissistic rule breaking isn't enough. are subject to the rules.narcissistic specialness is asserted by individuals, usually without a basis in their roles or talents. For example, they demand the right to arrive late to meetings. When they do, they demand that someone "catch me up" with what has happened so far. Typically, as with the catch-me-up pattern, narcissistic specialness also serves to place others in subservient roles. The risks of permitting narcissistic specialness to persist unchallenged include possible violations of law or regulations, escalating resentments by others, team fractiousness, and wasting organizational resources. It isn't enough for Nora to break the rules; she needs to break the rules within the awareness of those others who are subject to the rules. That awareness enhances the feeling of specialness while it creates resentments about uneven application of enterprise policies and social norms. As Nora's supervisor, you can try to compel compliance by talking to her and explaining that there will be consequences for non-compliance. But realize that Nora is likely to view this framework as yet another rule to break. Because she's likely to try to circumvent whatever consequences you describe to her, prepare in advance by coordinating your strategy with any parties she might turn to for support in seeking a waiver or in seeking your own dismissal. These individuals include your own supervisor, your human resource representative, and her previous supervisor. Depending on Nora's rank, you might require support at the highest levels of the organization. Unless you receive strong assurances of support, dealing with Nora directly is risky, because she's likely to prevail. This probably isn't her first rodeo. As Nora's co-worker, be certain that Nora's supervisor is aware of the unfairness of Nora's special treatment. But if you cannot register your views with Nora's supervisor anonymously, take care. If Nora discovers that you've taken action, she'll very likely to respond by attempting to harm or discredit you. Safety is important. Take no action that places you in danger. Would you like to see your comments posted here? rbrenoNeoBByOJNyrevxNner@ChacGsfhlfrvLsEubffNoCanyon.comSend me your comments by email, or by Web form. I offer email and telephone coaching at both corporate and individual rates. Contact Rick for details at rbreneGPDfzblpSwmpYMfner@ChacSotxbGkSgpzmvqSeoCanyon.com or (650) 787-6475, or toll-free in the continental US at (866) 378-5470.